PSA: Bumpers rails have been raised! Noobies often activate every available plugin and get ctds when they try to load the game with patches for mods they haven't installed, so compatibility patches are now nested in the /Compatibility/ folder. Don't like one of our redesigns? 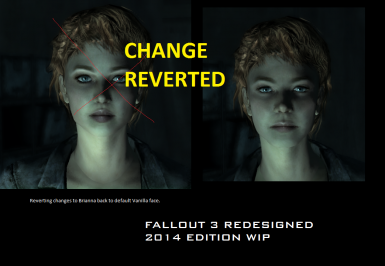 You can revert any NPC you don't like to vanilla by editing our mod with an editor like FO3Edit and simply deleting the characters you want reverted. Voila! Back to normal. what body mod do you guys recommend? 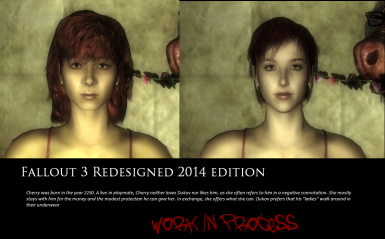 or a texture upgrade for the body ? 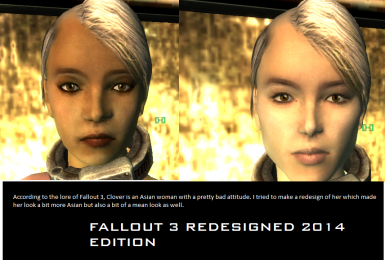 right now the characters look funky because the skin tone doesnt match up right, I mean its not an error, they whites have white skin. its just the slight tone difference of the body looks strange at the neck because it just jumps to another slightly off color. does this workj with TTW? 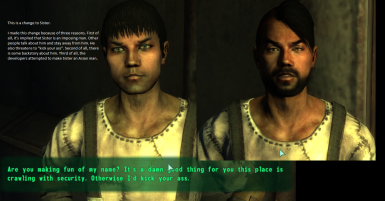 This is a fairly late reply, but I don't see why it wouldn't be, since I'm actually using this mod in Fallout New Vegas alone. I'm a bit confused after un-zipping the file before installing it. When I look at the texture files, they are considerably smaller than textures that I already have installed. If this is HD, why is that ? Honestly dont know what I am doing wrong. I seem to miss textures, people are purple and sometimes get those red alert signs instead of textures. 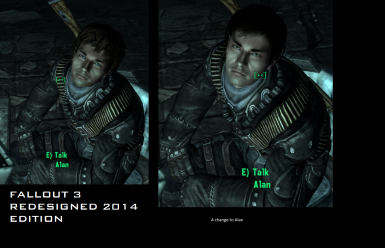 Where did you get the eyes for this mod...best ones i;ve seen, i don't like the face textures on the men much so was using the standard no texture version but that means no cool eyes...any chance you can point me to them or a way to get them in the standard version of the mod. 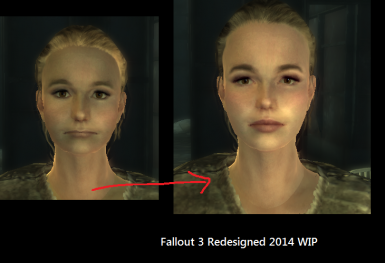 Thank You for making the ugly go away in FO3 otherwise! Awesome. I installed this mod earlier today. It worked perfectly fine. I installed fose, and the animation rework mod + iron sight mod. I started a brand new game, using the fose loader exe. When I enter the first cut scene when the player is born, there are huge red and white bars all across the screen, to a point I can't edit or design my characters. I wasn't sure which mod was causing this problem, so I disabled and enabled every mod to check. It seems like it is this one that's causing the problem. 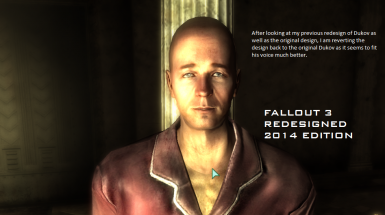 I deleted this mod, and reinstalled. I have the latest ArchiveInvalid thingy installed too. The problem still exists. Probably a dumb question, but how do I get NPC's with new hair like Sydney's tweaked appearance? 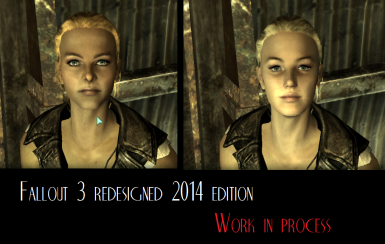 I have the hair packs installed and am using the optional merged version but she still has the vanilla haircut, though her expression has shifted to look like the one in the image. Is this mod compatible with Simply Uncut? ? I feel like it SHOULD be, since this mod say that it will conflict with any other mode that adds changes to NPC's, because Simply Uncut seems like it only ADDS NEW NPC's that were originally supposed to be in the game, but were cut. What do U guyz think? ? 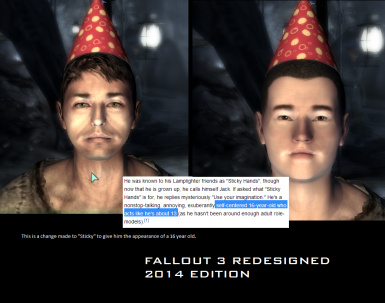 You can check this yourself by opening up both files in FO3Edit. Look or filter for conflicts (marked red). How do I fix the "An Exception Occurred in the Script Issue"
For additional info, the permission that failed was "SystemSecurity.Permissions.EnvironmentPermission"
Edit: whoops I accidentally commented on the wrong mod, sorry. 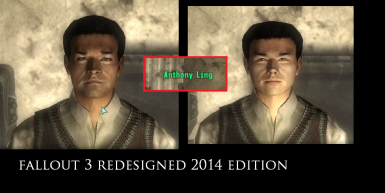 I have this weird issue that the custom hairstyles supplied with the mod have the hairline way up high, so you have to raise eyebrows and eyes a whole lot. I'm not sure if that's supposed to be how it is. I do realize the hairstyles weren't exactly the main focus of the mod AND other than this bit, I find the mod to be very enjoyable. But I do have to admit that a lot of the hairstyles are unusable the way they are.